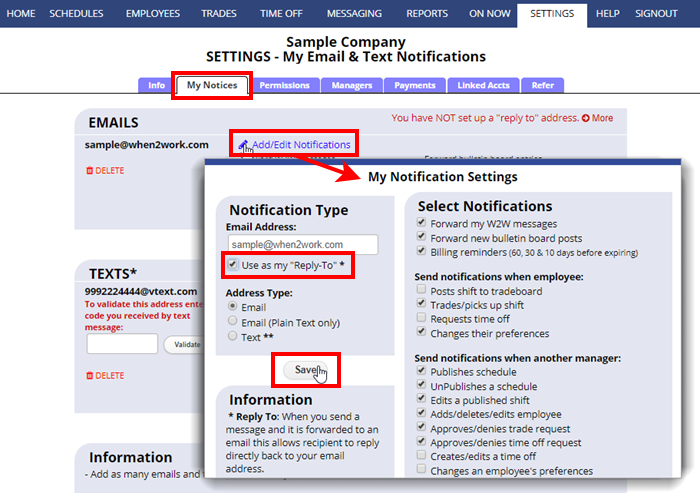 When you send a WhenToWork message, it will go to the recipients’ account messaging section. If the recipient has set up to have their messages forwarded to their email address, they will also receive a copy of the message by email. All managers and employees can set up their own “reply to” address so that others can reply to forwarded message emails directly back via email. If you set up one of your emails as your “reply to” address, the email recipient can click to reply to forwarded messages (instead of having to sign in at WhenToWork, find the message and then reply from there). This means that when someone receives a forwarded message, they can click “reply” and send you an email in response directly to your email address, outside our system. You might not want to set up a “reply to” address if you do not want your employees to know your email address or if you prefer not to get emails from them.